When it’s time to clean your deep fryer, you may have wondered what you need to properly clean it. They are not complicated to clean, and you won’t spend too much time worrying about cleaning it. You want to make sure you clean it deeply and thoroughly to prevent any hazards from your deep fryer. Any leftover burned food can become a fire hazard, and the deep fryer can have leftover grease that can become dangerous. This article will talk about what you need to properly clean your deep fryer, and how to properly get rid of unwanted grease spots. You want to start out by getting all your cleaning supplies ready. You want to get some soapy water and a couple of cloths. You will need a container for the excess oil, if you can reuse it. If the oil is still good, you can pour it in the empty container, and put it aside. You can pour the remaining oil after you’ve cleaned it. If the oil needs to be thrown out, make sure you put it in a container you can throw out without it spilling everywhere. You want to unplug the deep fryer, and wrap the cord up in plastic to avoid any water from damaging the cord while you clean. You want to use some paper towels to wipe down any remaining oil left in the deep fryer. You can start from the inside of the fryer, and work your way to the outside. You want to take the oily towels and throw them away. You want to try and soak up any excess oil before you start deep cleaning the fryer. If you have to, you can place a few paper towels inside the deep fryer to ensure they soak up the remaining oil. Getting the excess oil will make it easier to clean the deep fryer. Some deep fryers such as T-fal FR8000 EZ Clean Deep Fryer has dishwasher safe and removable parts so it is easy for you to just put the parts in your dishwasher. However, for other deep fryers you need to use the soap and water to clean them. When you’re ready for the soap and water, you want to use a lukewarm cleaning solution. Any degreasers or tougher chemicals can cause damage to the deep fryer. You can use dish soap to clean your deep fryer. You want to use a soaked sponge that isn’t too wet. Using a damp sponge allows you to scrub the deep fryer without getting water inside the deep fryer. Since the deep fryer has a lot of electrical components, preventing water from getting inside your deep fryer will keep it from shorting out. You will then want to clean the filter. You can use high-pressured water to make sure it’s cleaned up. You don’t want too much pressure put on the filter, since it can damage it. You can use the kitchen sink to clean the filter. Turn on the water and set it under the faucet. If you have excess buildup in the filter, you can use a soft-bristled brush and soapy water to help you clean it deeper. It’s the best way to make sure the filter is completely cleaned out. When you use your deep fryer multiple times, it can have an odor to it. You want to mix a little bit of water with some vinegar. You can fill the deep fryer with the solution, and the chemical mixture will react with the remaining debris. 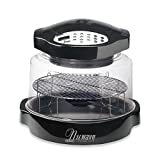 It will neutralize the smell, allowing you to have an excellent smelling deep fryer. You will want to pour out the solution, and then rinse out the deep fryer with only water. When you use the deep fryer, a crust can form on the outside of the deep fryer. While it may be tempting to use harsh chemicals and a scrubbing brush, it won’t help. You can use a branded degreaser, or baking soda and water. You can then use the combination to slather it on the outside of the deep fryer. Once it’s on the outside of the deep fryer, you want to let it settle on it for around 10 minutes or so. You can then take some paper towels and wipe away all the grease and grime leftover from the combination. Deep cleaning a deep fryer can feel complicated, but it’s easier than it looks. If you take the proper precautions and avoid any excess chemicals or scrubbing, your deep fryer will look like new. It’s the best way to ensure you get rid of all the old oil and grime that can become a hazard. This way, when you use the deep fryer, everything will taste better, and the deep fryer will look like new.